Buy Online Now! 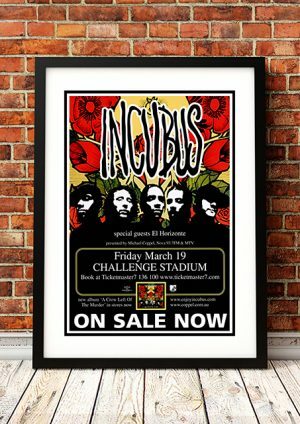 Classic Incubus Band Posters and Memorabilia! 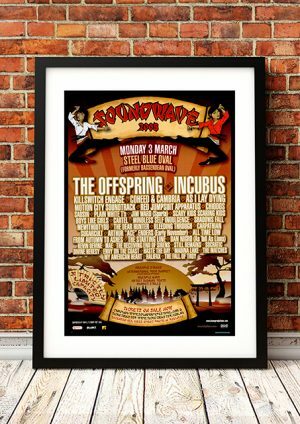 Incubus became one of the most popular alt-metal bands of the new millennium, setting themselves apart from a crowded field with a tireless touring ethic and a broad musical palette. Formed in 1991 in the San Fernando Valley suburb of Calabasas, California, the band’s early lineup comprised tenth-grade classmates Brandon Boyd (vocals, percussion), Mike Einziger (guitar), Alex Katunich (aka Dirk Lance; bass), and José Pasillas (drums). Their early funk-metal sound was heavily influenced by the Red Hot Chili Peppers, but broadened over the next few years to incorporate thrash, rap-metal, post-grunge rock, and grinding alt-metal à la Kornor the Deftones. By the time the musicians had graduated from high school, they had already been playing all-ages shows around Southern California on a regular basis. In 1995, Incubus added hip-hop turntablist DJ Lyfe (aka Gavin Koppel) to their lineup and recorded the independently released album Fungus Amongus. We stock some awesome Incubus Band Posters.